It's safe to lump asters in with begonia, impatiens, and petunia as typical outdoor plants that you probably don't think about growing indoors. Indeed, these flowers in their clumps of white, pink, and various shades of purple, are a longtime favorite of outdoor gardeners, who plant clumps of them in the spring and enjoy their blooms for months beginning in the mid-summer. Over time, they eventually form nice clumps of flowers that you can easily subdivide and give away to friends. Indoor gardeners, however, can also enjoy asters. Light: Asters are a full sun plant, so provide as much light as possible. They can be grown in partial shade or dimmer light, but they'll never perform as well as plants with more light. Water: Related to sunflowers, these plants have fairly high water requirements. Keep the soil continuously moist and look for signs of wilting, which could mean the plant isn't receiving enough water. Fertilizer: Feed weekly with a weak liquid fertilizer every other week that includes micronutrients and encourages blooming. Soil: A light, fast-draining potting soil is perfect. You can use fortified soils. Most gardeners start asters from seed. It's best to start them in the early winter or late spring indoors in a typical seed-starting set-up. Aster seeds readily germinate and grow quickly, providing you give them enough light. Look for signs of stretching in the seedlings; this is a sure sign they're not getting enough light. If this happens, either move them to a brighter spot or invest in some grow lights. A pot of asters under ideal conditions will begin to bloom within several months of sprouting. Although there are perennial and annual forms, it's unlikely you'll keep them too long after the bloom fades in the fall and the plant begins to die back. If you are growing the perennials, move the pot indoors in the fall after the blooms begin to die and keep the water barely moist throughout the winter until new plants emerge in the spring. Annuals, obviously, will die at the end of the season and will never need to be repotted. As a last note, if you buy aster transplants from a garden center, it's probably a good idea to transplant the young plants shortly after you get them home. Simply slip them into a larger pot to give them room enough to get through the growing season. There are two main kinds of asters: perennials and annuals. Among the perennial asters, plants have been bred for vigor, flower color, and size. Pick your aster based on the flower color and size. For indoor gardening, the smaller asters (about a foot in height) are much more practical than the larger varieties. Among annual asters, the so-called China aster is a very popular plant. Although a bit more delicate than its perennial cousin, many people prefer their flowers, which tend to last longer. 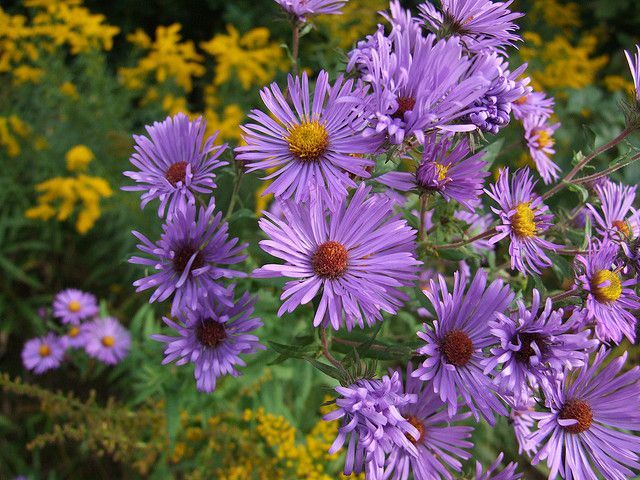 There is much to recommend about asters: they are fast-growing and have great flowers. The main problem indoors will be light; asters need a lot of light, and if you can't provide enough, they will become leggy and not flower as much. To encourage better blooms, pinch off old flowers as they begin to fade. A well-tended plant can sometimes bloom for four months or more. When growing asters, also be aware of bug issues. They are vulnerable to spider mites, aphids, and mealy bugs, so look for signs of infestation and treat immediately. Some asters also contain a common allergen that might trigger symptoms of hay fever. For best effect, display them in masses in front of a sunny Southern-facing window.